From shark’s teeth to flint knives, men have always been in search for a tool that can give them a good shaving experience. The pursuit to find that perfect shaving tool took a great leap with the invention of modern electric razors. And the Braun Series 9-9095cc Men’s Wet/Dry Shaver is one of those leading shavers that are fueling this change of belief. With my personal experience with this shaver, I have decided to write my own Braun Series 9-9095cc review. It’s been a long time since the German brand, Braun, began dominating the electric shaver market and they have recently designed this Braun Series 9-9095cc Men’s Wet/Dry Shaving and Cleaning System with thorough research and engineering to keep dominating further. It has a sleek charcoal and dark gray body along with gray and black cleaning unit. As compared to other electric shavers from Braun, this one is more aesthetically built to ensure that it can attract users not only with its performance but also with its looks. On the inside, Braun Series 9-9095cc Men’s Wet/Dry Shaver has a mighty SynchroSonic motor that allows the blade to vibrate at a mind-baffling speed of 40,000 times in a minute. While some of the best electric shavers for men available vibrate at about 15,000 to 18,000 times per minute, you can easily imagine how powerful the performance of this one can be. Braun’s trademarked Intelligent SyncroSonic Technology allows Braun Series 9-9095cc to have 10,000 micro-vibrations per minute. It can deliver astounding 40,000 cross-section cutting strokes in a minute by reading your face and the beard density to cut more hair. The impressive speed of this shaver ensures that your shaving results are close and neat, and the total time required to complete your shave is not more than a few minutes. This shaver’s head contains 4 specialized cutting elements that work in complete synchronization to give you the best shave possible. Each of these elements has a different function to perform so that you don’t have to put in any extra efforts to shave on any part of your face and neck. a) OptiFoil: These cutting elements play the most important role to give you the close shave you enjoy with this shaver. The blades of Braun Series 9-9095cc are covered with a foil sheet to prevent the blades from making direct contact with the skin. Aside from preventing cuts and nicks that are very common in manual razors, this technology also allows the shaver to glide easily over the contours of your face. c) Direct&Cut Trimmer: This technology helps catch hair that grows in various directions for effective cutting. The overall appearance of Braun Series 9-9095cc is quite pleasing to the eye. This cordless shaver has an attractive and sleek design, and comes with a black & grey cleaning unit as well as a charcoal casing. It also features a blue-colored LCD indicator and a round power on/off button. This ergonomic model is comfortable and easy to grab throughout the whole shaving session. I’d not mind saying that I enjoy every moment of using this amazing Braun shaver. 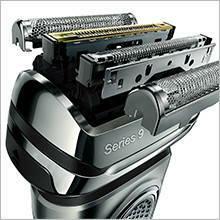 The head of this shaver can be locked at five different angles to offer ultimate precision. You can use a particular angle while you are shaving the jawline area and then move to a different angle while you reach your neck for getting dynamic results. Also, if you frequently have to lock and unlock the shaver head while shaving, this feature will save you from this inconvenience. This electric shaver has a precision trimmer that can be used to trim and give quick final touches to your sideburns and mustache. I personally don’t prefer using it to trim thick beards because this will make the blade dull sooner than expected. With this shaver, I never have to worry about if it has enough charge to complete a shave since the LCD display shows me the amount of charge remaining in the battery. The display also has two other indicators; a cleaning indicator to know when it requires a clean and the travel lock so that it doesn’t power itself on when put in your briefcase while traveling. Braun Series 9-9095cc features a Clean&Charge Station to make the cleaning process easier. The station charges, cleans, lubricates, and dries the shaver without your intervention. The station has an Automatic Program Selection that indicates when your shaver needs cleaning and selects the mode for maximum cleaning intensity. 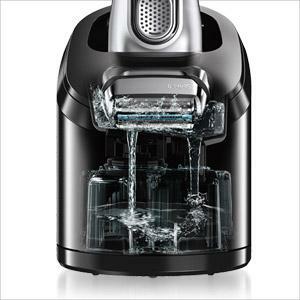 It also has a Fast Clean Program that cleans the shaver in just 25 seconds. The system runs without making any noise and turns off automatically when done. 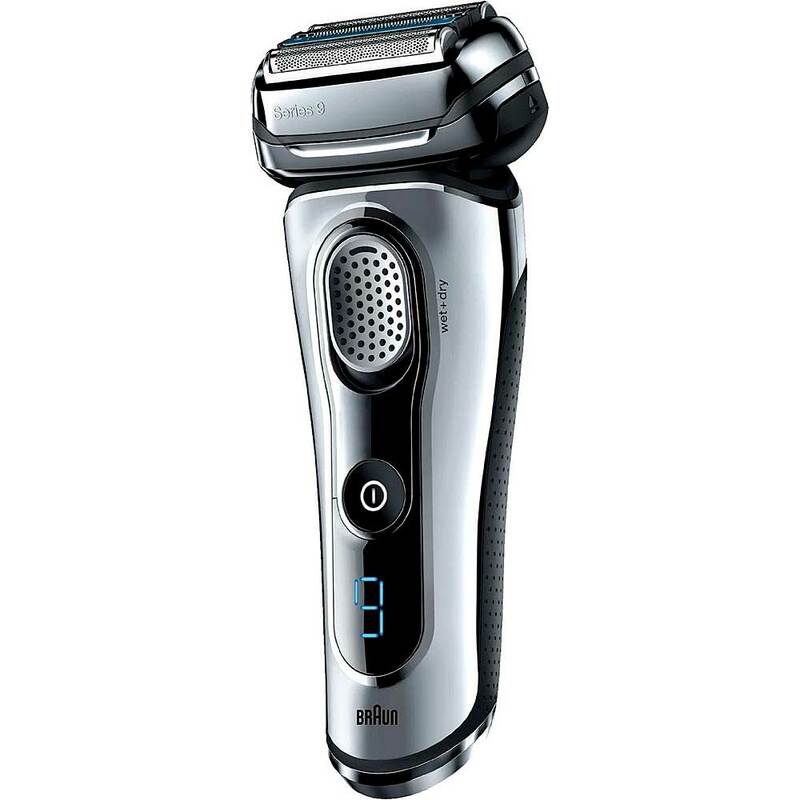 The Braun Series 9-9095cc Men’s Wet/Dry Shaving and Cleaning System comes with a Li-ion battery having no memory effect. 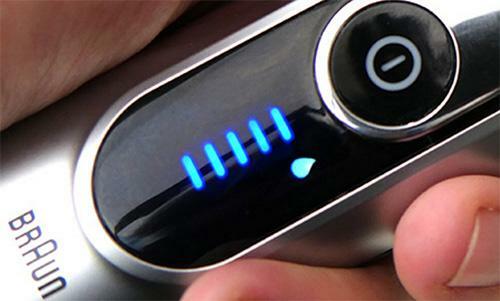 It requires 60 minutes to be fully charged and with it, you can have around 50 minutes of continuous shaving. But if you are in a hurry, its quick charge feature is there to give you a complete shave in just 5 minutes. I like to shave when I take a shower. As the shaver is 100% waterproof, I don’t have to finish my shave first and then get into the shower as I can easily carry it with me. Moreover, the grip on the back of the shaver prevents accidental slips when your hands are wet. Sonic technology with 4 expert cutting elements to catch maximum hair from every part of your face and neck. The shaver glides smoothly and delivers flawless, effortless results every time. The head of this shaver adjusts itself as per the contours of your face. Starting from the cheeks, it will glide all the way to your neck and then up again in a single stroke. While a lot of electric shavers that I’ve personally used had trimmers, none of them could provide me with the precision I always wanted. However, the precision trimmer of this shaver is very easy to use and powerful, and gives me the desired results in the least amount of time possible. Even though this shaver’s motor is very powerful, it doesn’t make any noise while shaving. At most, you will hear a light buzzing sound. The cleaning station of this shaver is a bit heavy, making it difficult to carry while traveling. The travel case is just for the shaver alone and therefore, you need some extra space in your luggage to carry this shaver. Although this shaver head is the place where all the powerful technologies combine together, some of the electric razor reviews I went through complained that they felt the head is too wide and difficult to control while gliding over the facial skin. While I believe that the shaver is worth every penny, some may find it expensive for the budget. But I can guarantee you won’t regret buying it after enjoying its top-notch features. For cleaning, you can use the automatic cleaning system that requires a cleaning-solution cartridge, or you can clean it manually as well. This electric shaver is 100% waterproof and can be washed under the tap by the included cleaning brush. I prefer cleaning the shaver manually, but I also use the cleaning system every twice or thrice a month. Maintenance is pretty convenient as well. It gets charged pretty quickly and I prefer charging its battery completely and using all of its charge before plugging it into the charger again as this helps to increase the shelf life of the battery. The head of this Braun electric shaver needs to be replaced every 18 months to ensure optimal functionality. Braun has designed this shaver by keeping in mind the shaving needs of a modern man. Our busy personal and professional lives leave little time for us to spend time on shaving and this shaver is created to deliver the best results almost instantly. It is extremely user-friendly and this feature can be seen in every aspect of this shaver. From its functionality, charging, cleaning to its maintenance, everything is super quick and super-efficient. This section of this Braun series 9-9095cc review is the most important part as in the end, it all comes to the shaving performance. The Series 9-9095cc is surely an epitome of modern technology and undoubtedly one of the best electric shavers from Braun. No matter whether you like to shave daily, once in 2-3 days or love growing long beard, this shaver will provide you with flawless results in every application. It is completely safe for men with coarse hair or who has very sensitive skin. It is extremely quick and like manual razors, will never leave you with cuts, nicks or pulling of hair. Braun Series 9-9095cc Men’s Wet/Dry Shaving and Cleaning System comes with a 2-year warranty. The Braun Series 9-9095cc electric shaver is one of the highly rated electric shavers on Amazon.com. While a lot of people believe that this price is too high for an electric shaver, I highly doubt it. This shaver is made with the latest technologies in the world of electric shavers and has a highly durable built. Thus, it is sure to give you exceptional results for a long time to come. Moreover, it also comes with the cleaning and charging station that make the cleaning process quick and easy. Braun is one of the most famous brands and is available in most of the countries throughout the world. Thus, the replacement parts of Braun’s electric shavers are easy to find as compared to other brands and models. You can look for them at your local dealer’s shop or online shops like Amazon, Walmart, eBay. Braun Series 9-9095cc is undoubtedly one of the best electric shavers for men as it has a number of features that aren’t available in other shavers. If you are looking to upgrade your shaving experience, this is certainly the best electric razor you can choose. I tried to cover each and every aspect of this shaver in this Braun series 9-9095cc review. If you think I’ve missed something or want to share your experience with this shaver, please do so with the help of the comments section below. 1. How long does the cartridge of the shaver last for? Ans: I usually use the cleaning system once in a week. For me, it easily lasts for about 3-4 months. The cartridge is easily available at the retailer’s store and you can also find it online. 2. Do I need to place the shaver in the cleaning system to charge the shaver? Ans: Yes, that is one of two ways to charge your shaver. But you can also directly plug your charger into the shaver to charge it. 3. I have a Braun Series 7 electric shaver that came with the cleaning and charging station. Can I use its cleaning and charging station with this model? Ans: No, cleaning and charging stations are model-specific and cannot be used with any model. At most, you can use the cleaning solution cartridge. Braun Series 9-9095cc electric shaver is the most costly shaver I have ever seen. With this I also admit that the features used in this awesome shaver are just unique. You will never find a shaver like this except Braun. Best of luck to those who has got money for this. I will be waiting for next Christmas to buy this.